Showing results for tags 'sleeping'. 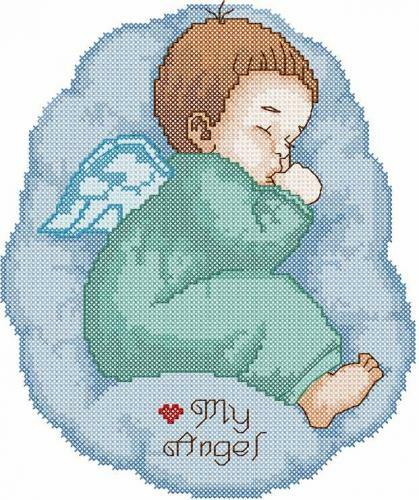 This yellow terry towel is decorated by Sleeping angel free embroidery design. The colors of embroidery sample are chosen in accordance with the background. 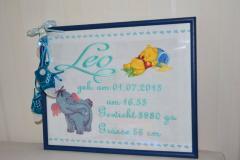 The main picture is surrounded by the memorable inscription which is dedicated for the addressee of this gift. The basis of color scheme of this embroidered towel is the beautiful combination of yellow and blue colors which is bright enough to please the child who will be the owner of this thing. It is the soft white pillowcase made of nice fleece. Its highlight is Sweet dreams and good night machine embroidery design. 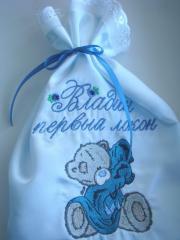 It depicts the head of funny little bear which is sleeping sweetly on its gentle pillow decorated with bow. It is covered with a warm blanket and keeps the clack in its paw. Final part of composition is the suitable inscription. The picture is made with different shades of blue color which inspires pleasant dreams. Look at this wonderful embroidery. It will be a decorationfor any thing. Buy the design here: Teddy Bear getting ready for bed embroidery design. 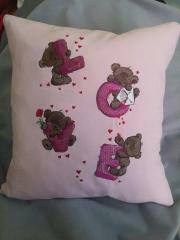 This is nice and soft little cushion suitable for child’s room. It is not very difficult to male it. You need just pillowcase of light color and necessary embroidery samples. They are Teddy Bear with letter L embroidery design, Teddy Bear with letter O embroidery design, Teddy Bear with letter V embroidery design and Teddy Bear with letter E embroidery design. On this picture you may see fragment of child’s blanket made of bright quilted cotton. 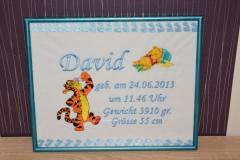 It all is decorated with funny figures of characters from beloved cartoon about Winnie Pooh. You may find them in our Winnie pooh and friends machine embroidery collection. Here there is merry Tiger together with big letter D on Tigger letter D free machine embroidery design. Your child will definitely remember this original letters. 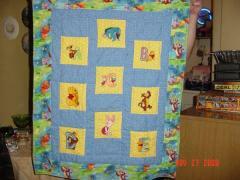 This is nice blanket for children executed in popular patchwork technique. This work piece is decorated with come samples from our Winnie pooh and friends machine embroidery collection. They show figures of favorite characters added by first letter of English alphabet. So your child can not only look at funny cartoon pictures but also remember useful letters while sleeping. 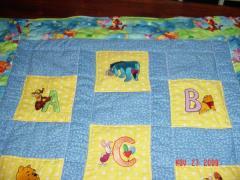 This is pretty children’s blanket made of pleasant quilted cotton. It makes this work piece durable and comfortable. This thing is decorated with some samples from our cute Winnie pooh and friends machine embroidery collection. You also can pay your attention on right choice of printed fabric used to its border. It has pictures of characters from same cartoon. This is pretty interior cushion made by which is able to be highlight of your room. It is quite simple in execution: you will need just piece of dark fabric and thread of one color. But together they can make very elegant and romantic accessory. It is because of usage of Sleeping unicorn free embroidery design. This pretty picture is so cute! This is pretty set for little baby. It is able to make his meal clean and pleasant. This set includes bib and napkin decorated with same embroidery sample. It is Sweet hedgehog's dreams embroidery design. This is picture of cute hedgehog sleeping right on moon. It is lying on its soft pillow and covered by warm blanket. Picture is added by suitable inscription. This is soft and pleasant little cushion executed from comfortable fleece. It is decorated with very suitable embroidery sample which is able to make its owner sleepy when laying head on it. 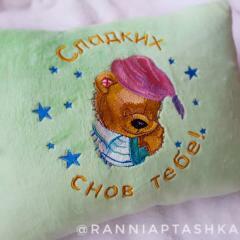 It is Old Toys Sweet Dreams My Baby embroidery design. You can make another inscription for this embroidery as its author did for this pretty work piece. 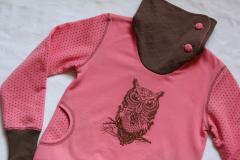 Embroidered set wth Sleeping baby design. 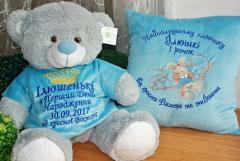 This is pretty embroidered set prepared for first birthday of little boy. It consists of cute soft toy in bright clothing and comfortable pillow executed from same fleece fabric. Both of these items are decorated with memorable inscriptions and embroidered pictures. 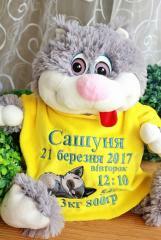 One of them is Sleeping baby with bunny toy free embroidery design. It will help little baby to sleep well. This is funny fluffy toy with tongue out. 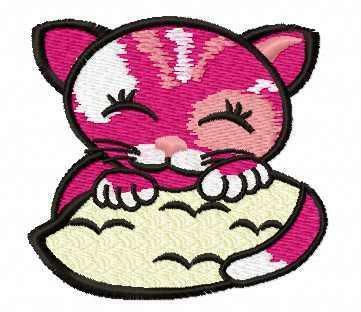 It is dressed into bright clothing decorated by Cat's dreams embroidery design. This work piece is prepared for special event. It is birth of little boy. This memorable souvenir will save all important information about it including boy’s name, weight, date and time of birth. It is really nice idea to create this unique thing. This is the nice collage of nine embroidered pictures of funny cats. All of them are executed at the same manner which reminds the sketches made with the black pencil on the white surface of paper. In fact they are made with the black thread on the pieces of white fabric. 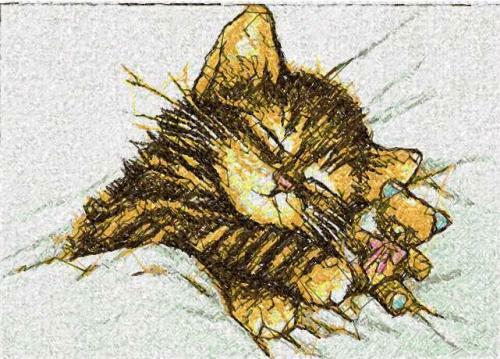 Here you may find some interesting embroidery samples such as Drinking cat free embroidery design, Sneaky cat free embroidery design, Smoking cat free embroidery design, Funny cute cat free embroidery design, Running cat free embroidery design, Cat with a contrabass free embroidery design, Sassy mouse and cat free embroidery design and Unhappy cat with flowers free embroidery design. This soft pillow decorated with pretty embroidery, will give you the most magical dreams. Here you can see little magic girl sitting on mushroom who is looking carefully on funny frog on flower. Mushroom fairy embroidery design is framed by striped background made from pleasant cotton fabric. This cute cushion can be element of interior and soft accessory for truly sweet sleeping.